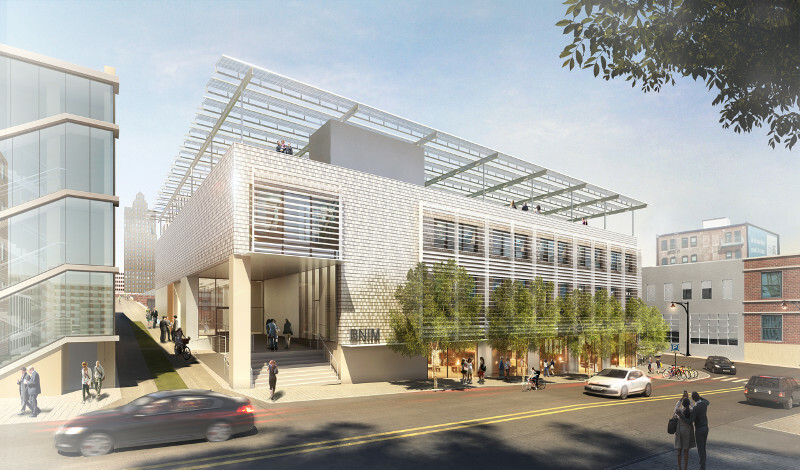 The conceptual design for BNIM headquarters, “Building Positive” incorporates a public plaza that would help build a patchwork of native landscape for pollinators in downtown Kansas City, Missouri. The idea came out of a workshop exercise connecting the design professionals in attendance with living systems in the city around them. A design team can enable real progress by setting aside a day or longer for a focused workshop. Or it could just waste a lot of high-priced time. You can break down barriers and build a functioning team if you bring together people in different roles who don’t usually get to talk with one another. Or you might just reinforce existing stereotypes. Get the right kind of discussion going, and you can move as a team toward innovative solutions. Or you can squeeze the life out of a room with an agenda that feels like a forced march. This article is about design workshops: who, what, where, when, and why. My hope is that in reading it, you’ll pick up at least three ideas that you can’t wait to apply in your next workshop—whether it’s a short internal meeting, a half-day design exercise, or a long charrette with dozens of people. If this article had an agenda, it would be a pretty loose one. You can read it from start to finish, or skip around and pick out what’s useful. Whatever ideas or thoughts it sparks, or whatever feedback you have, please consider sharing. There’s a flipchart and marker (actually just a comment form) down at the bottom of the page, and you can email me. I read every message. Choreographing the project process includes designing key components, clarifying the role of workshops in a healthy process, and identifying what you call them and who should attend, among other things. An early design workshop and a collaborative design process go hand in hand. While this article doesn’t go into the value of integrative design (see How to Make Integrated Project Delivery Work for Your Project and Integrated Design Meets the Real World), let’s take a minute to talk about the value of a day-long (or longer) workshop with a large group of stakeholders. BuildingGreen thanks the following for speaking with us for this article. Nadav Malin – President, BuildingGreen, Inc.
Jacob Werner, AIA – Director of Sustainable Design, Wilson Architects Inc.
That idea didn’t last, however. The site was constrained by transit on three sides, and there wouldn’t have been room for cranes to safely erect the structure. The design moved to a more conventional solution for Portland: a post-tensioned slab. But the idea of integrated HVAC and structure stuck around. According to Petterson, the team asked, “Why shouldn’t we put radiant heating and cooling in the post-tension structure?” It hadn’t been done, but the group, already functioning well as a team, took the time to coordinate on the design and embed hangers in the slab. In the end, the whole project was shelved, but the viability of the solution has been proven out on other projects that have used it, according to Petterson. The term “charrette” isn’t going away anytime soon. However, a number of people we spoke to for this article prefer to call an extended design meeting simply that—a meeting, or, more often, a workshop. Clark Brockman, AIA, principal at SERA Architects, agrees, adding, “Clients are more comfortable investing in a workshop” than a charrette. Even if you prefer the word “charrette,” don’t call it an “eco-charrette.” That term feels dated—for a couple reasons. One is that the “eco-charrette” has become associated with a dry exercise of dragging team members down a checklist. Also, treating sustainability as a separate topic in its own silo simply doesn’t support an integrative process; it allows those concerns to be marginalized and green features to be value-engineered out. None of this is to suggest that having a multi-day workshop isn’t worth it. If anything, the evidence is that having a workshop moves a project along quickly and to a high level of performance. And there is a trend of projects that do multi-day events to dedicate day-long workshops to sustainability-related topics like daylighting and biophilia. As discussed throughout this article, the time invested in building a team and exploring key issues pays off over and over again. The professionals we spoke to for this article agreed universally on the importance of dedicated facilitation in a design workshop or charrette. An architect at a firm can be a skilled facilitator, but there are advantages to bringing in a third party, says Josie Plaut, associate director at the Institute for the Built Environment, which provides facilitation services. A 2015 white paper, The Social Network of Integrative Design, from the Institute for the Built Environment, argues that a third-party facilitator is in the best position to create an effective team environment because that is their sole agenda. The paper defines a third-party facilitator as either someone from outside the design firm, who may be a consultant on high-performance buildings, or a member of the design firm but without design responsibilities. They may have specialized training or tools. They foster a safe environment where everyone can freely express opinions. They help increase the interaction among architects and other team members. When architects are participating rather than facilitating, they learn more and build stronger relationships with the participants. Eskew+Dumez+Ripple provided pro bono design assistance for the Youth Rebuilding New Orleans nonprofit, developing plans for restoring homes for low-income residents. Exercises like this one elicit the needs and values of stakeholders, leading to a shared vision of success for the project. Other experts note that it’s valuable for the facilitator to have a designated point person in the group, such as a lead architect, to check in with. The facilitator can only read the room so much while also running a meeting. They benefit from having a second perspective, and someone to huddle and strategize with as the day moves along. The same person, possibly as part of a core group of participants, can help the facilitator plan the event. Referring to research contained in the white paper, Josie Plaut also emphasizes the need for a champion to support the kind of integrative design process found in workshops. “You need someone who is a champion on the design side,” she says, to ensure the integrative workshop process is supported and its value maximized. “Preferably you need the owner and the architect. If either one is opposed, then nothing’s going to happen,” but she says you can still move forward with having an integrative process if one is ambivalent about it. A common fear of an integrative design process bolstered by charrettes is “design by committee,” where nonprofessionals obstruct smart design decisions in the name of providing input. That’s not an unfounded fear, but it’s an avoidable one, according to facilitators we spoke with for this article. “Architects have a wide range of communication skills, which includes translation,” says Jennifer Preston. If occupants say they want a particular type of window in the façade, “it’s our job as design professionals to understand what is the intent behind that statement.” The occupant might be envisioning a certain shape or size of window, but through careful listening, we learn that what they really want is a comfortable place in the sun. To create the right kind of space, the designer considers a multitude of things—view, solar orientation, context in the plan. To get the kind of input you need from stakeholders, ask open-ended questions. Discovery happens there, says Preston. In workshops involving stakeholders who don’t know the design and construction process, make sure you’re clear about who’s providing input and who’s making final decisions. Integrative workshops typically have a democratic feel, but don’t let that mask hierarchy in decision-making. People are generally okay with this if it’s explicit and acknowledged. In post-Katrina New Orleans, three congregations had to merge in a restored facility. Using accessible tools and exploring what kind of values the groups held and how they would worship, this workshop helped them become one. The degree of preparation for a single workshop varies depending on the facilitator and the goals of the event. A good rule of thumb, however, is to spend at least as much time preparing as the workshop will take: a day or more for a day-long workshop, for example. One common way to prepare is to interview participants about the coming workshop and what they want to get from it. This may even take the form of a meeting of its own with a subset of the workshop’s participants. Asking a client for their highest hopes and their greatest fears for a project is one approach that that Lisa Petterson uses to figure out what’s really on their minds. Fears might be in red and hopes in green. You write down everything and then ask people to vote on their strongest sentiments. This approach worked well on a project that involved a renovation of an existing building and a large addition. “One of the fears was [that] there wasn’t going to be enough money to renovate the entire building, and there was going to be hodge-podge” left over, she says. “It would have been easy to focus all the attention on the new building” in the workshop, she says, but because that concern had been aired, they knew they had to dedicate time to problems they wanted to fix in the renovation. Depending on the workshop, you could establish trust, put specific topics on the agenda, and guide specific discussion topics in one fell swoop. 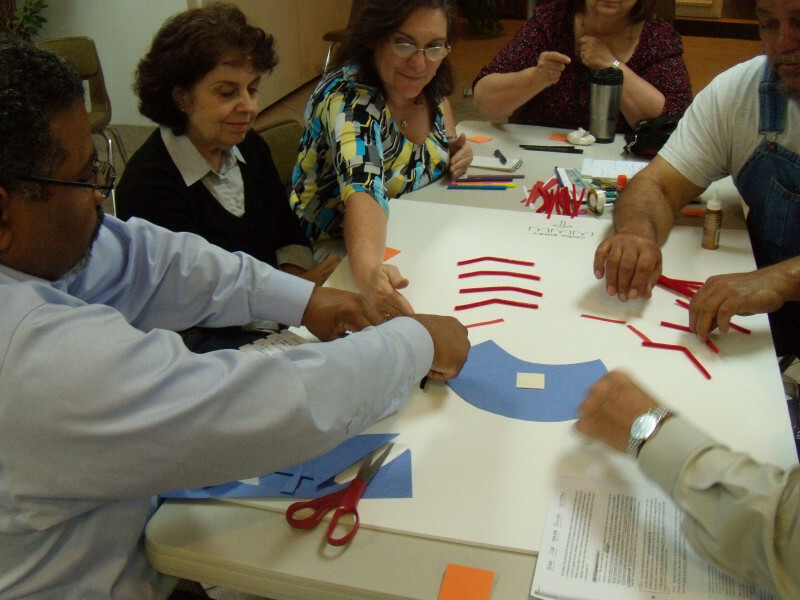 Richard Crespin of CollaborateUp is facilitating a series of workshops, through a grant from the Robert Wood Johnson Foundation, to look at how businesses can play more of a role in community health. With 200 people sitting around tables, and a slate of speakers on a dais, Crespin gives the audience the first word. He asks the people at tables to introduce themselves to each other and name what they think is the number-one barrier to a healthier city. Each table confers and agrees on one item, then shares it with the whole room, generating about 20 items. Then every single speaker has to get up and speak to one of those topics. The rest of the workshop goes back and forth between the stage and the small groups. Clear direction to speakers: “Left to their own devices, they might have spoken right past these issues.” They don’t need to make things up, and they don’t have any reason to waste time formulating bland speeches. The workshops wrap up with commitments—something each attendee is willing to do within a short period of time. “They are now part of something larger than themselves,” says Crespin. Most people don’t want to sit brainstorming for eight hours straight, if they can even last that long without getting bored, disengaged, or tired. But different groups have different priorities. Do they want to move around? Do they want small chunks? Do they want to break things up with pecha-kucha style presentations? Different groups will name different preferences that can be used in designing a workshop. Of course, keep in mind that the facilitator, as with the role of the architect discussed earlier, is a translator. Look for what the group wants the day to feel like, not necessarily what the specific activities are. “After that, it’s hard to do anything,” says DiNola, based on his experience with dozens of workshops. Ralph DiNola has been a part of five-day charrettes and half-day ones. If you’re pressed for time, what should you focus on? He breaks it into the following hierarchy: you start with a vision or mission statement. In order to achieve that vision, what are the goals? (They should be measurable.) Then get down to the core strategies that will help you achieve those goals. Who you invite, how you frame the conversation, and even the food you serve, can all be design opportunities to bring you closer to your goals. 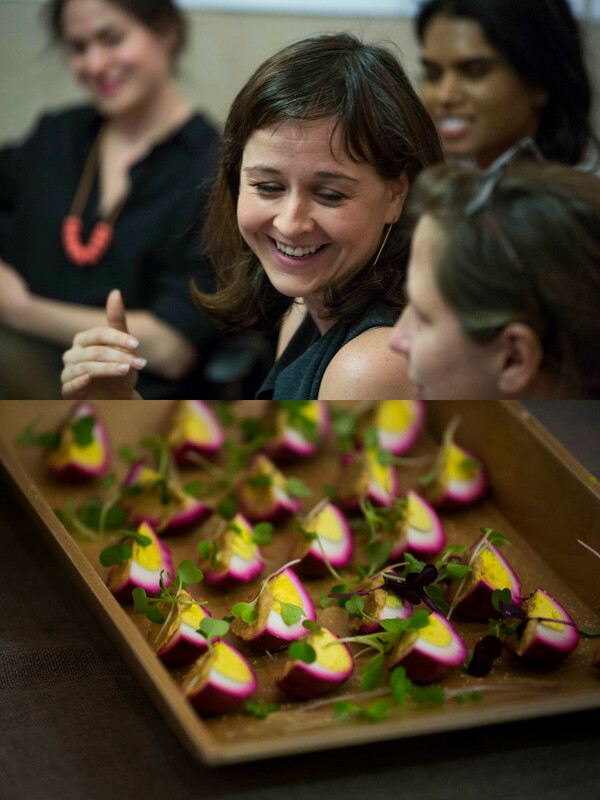 A recent design workshop at BKSK Architects included a spread of whole foods, including eggs pickled with beets. BKSK’s design team believes in nourishing project participants in a way that aligns with their values and supports an encouraging atmosphere. One of Phaedra Svec’s approaches to workshop design is place-centered. She’ll ask herself, “What do we need to know about this place and all the people who have a stake in this place?” That leads to a lot of thought about who is invited, with a focus on disciplinary diversity. For an early-phase interdisciplinary design workshop, Svec wants to have—to name a few—an investor or someone who’s focused on finances; a facility manager; people who are responsible for the program; and people who are thinking about ecology and water. If it’s a university project, she wants someone from the greater community. If it’s an office building, someone from the neighborhood. For a net-zero-water project, Svec wants “everybody who has a stake in water in that system,” from wastewater plant engineers to irrigation system designers to the plumbing engineer to a landscape architect or engineer who’s an expert in living systems. Take the right people and the right workshop activities, “and then somehow because you’re all there together, you have enough of the little pieces of what you need to make the whole solution. And it’s really kind of magic,” says Svec. Awareness of differences in how introverts and extroverts contribute to a workshop, and how to support everyone’s voice, was a common theme from experts we spoke to for this article. “I mix up the process,” says Moshe Cohen. “There might be introverts who won’t say a word in a large group, but get them into small groups, and they are really comfortable.” Change the structure from large groups to small groups to pairs. A facilitator can float around and ask questions of specific individuals to bring them into the conversation. 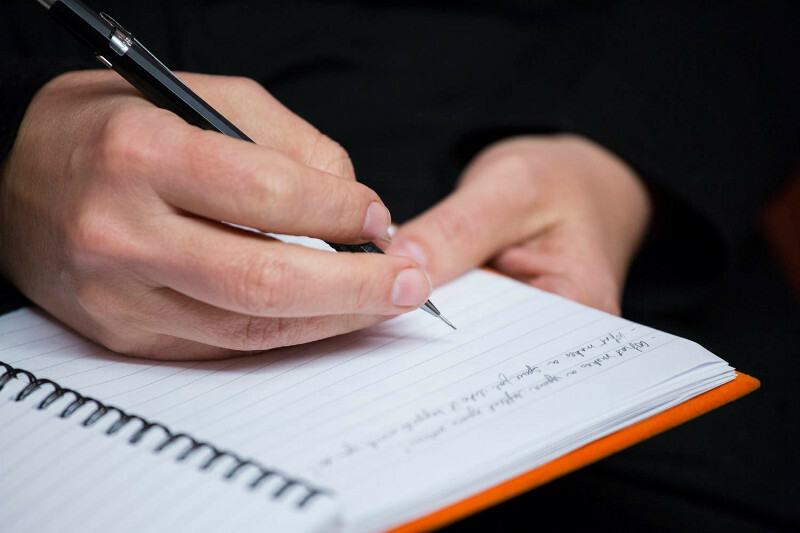 Mixing in reflective writing and speaking also tends to give everyone an opportunity to contribute. Before a group discussion, pose a question and ask everyone to write a few ideas in response. Then discuss those with your neighbor, and then discuss them with the larger group. That progression allows everyone time to organize their thoughts. “You as a facilitator have to be there to support even the most vocal, argumentative voices in the room,” says Moshe Cohen. “You don’t want to alienate these folks who sit in the back smoldering and looking for ways to sabotage” the day. Their interests might not be shared by others, but you have to work with what’s there, says Cohen. Either individually or in the group, get them to talk about their interests—which might not be what you think. The fewer assumptions you can make about where someone is coming from, the better. And often, when someone feels heard and sees the larger purpose of the room, they will cooperate more fully. Someone who disagrees with the rest of the room might have a critical point. What if the room is ready to move on to a new topic, but one person isn’t ready to let it go? Ask them why, and write out their interests. Then, negotiate a process to move forward that helps move the group toward success. Bringing an expert into a workshop who isn’t attached to the project can catalyze fresh thinking. On one project, a highly controlled laboratory building for nanotechnology research, Wilson Architects brought in engineer Peter Rumsey to a number of early workshops. Jacob Werner, AIA, director of sustainable design at Wilson, says that the team invited Rumsey because of his experience in regions outside of the project team’s core experience, and because of his sense of what is theoretically possible as well as what is sensible to pursue. The project’s programming puts it on the extreme end of energy use intensity, according to Werner, at about 1,000 kBtu/ft2. “Little things that might not matter as much” on a smaller building, “like coefficient of drag on the ductwork, can result in huge energy savings,” says Werner. Spurred on by Rumsey, the team looked at engineering the ductwork to reduce the static pressure in the system. The bigger ductwork will require more height but could make a huge difference in energy use. Setting ground rules for participants is second nature for experienced facilitators. Laying out such rules explicitly isn’t always necessary, but when they do need to be enforced, it’s better to have had the expectation out in the open. Great ground rules generally follow common themes, though they vary depending on the workshop activity. “Rules for brainstorming are different from rules for problem-solving or prioritizing or coming to consensus on a direction,” points out Nadav Malin, president of BuildingGreen and an experienced facilitator. The one rule Malin finds the most common application for across workshop activities is “one idea at a time.” When speaking (or facilitating), finish one topic before moving on to the next. That way, everyone knows what the current topic is and can develop it together. When multiple ideas are on the table, the group loses focus. Make sure everyone has had a chance to weigh in on a topic before moving on—especially those who might be inclined to hold back, whether due to personality or internal politics. Never respond or react to others’ ideas while brainstorming. No ideas are bad ideas. Name it; don’t explain it (at least not for more than a few seconds). The latter can feel like a tight constraint, but when enforced in practice, it helps overcome a couple of tendencies: to say something once and then explain it or repeat it in different words; and to move on to a related idea. Mixing reflective writing exercises, small-group discussions, and reporting out in large groups, as in this workshop at BKSK Architects, creates space for different personality types to formulate and share thoughts. A term sometimes used to describe the space created by ground rules like these is “safe.” According to the Institute for the Built Environment, every project it studied for its white paper on collaboration that had an ineffective process had one trait in common: a lack of safety and opportunity to share ideas. Ground rules like those above, when enforced tactfully, can go a long way. Many people will only become fully invested in a workshop and actively participate after they’ve assessed that it’s emotionally safe—that they won’t be ignored or be ridiculed for an idea. Establishing and reinforcing that environment is a primary function of good facilitation. It’s done by amplifying a comment that the group might otherwise have devalued because it didn’t come from someone in a position of power. Or it can come by respectfully interrupting someone who is taking the group off track. The latter is especially difficult but shows a commitment to the process and a focus on the entire group. It’s also about what you don’t do: talk down to someone or laugh at their expense. To set ground rules that fit your audience and speak to them in their language, listen carefully and be flexible. Facilitators often take risks in bringing their own language and methods to a group they don’t know that well. Talking about “safe” spaces isn’t everyone’s cup of tea, for example. “Trust” could be a better synonym for some audiences. Pushing people outside of their comfort zones can be constructive, but you don’t want to lose half the room simply because your language doesn’t fit their culture. It started with the simple observation that design staff show up to lunch-and-learns. Now, “in every meeting where I have brought a version of nourishment to it, there’s been an exhalation,” Preston says, which she claims can create room for discovery. With one client, her firm was leading an intensive four-hour workshop to evaluate the possible alignment of LEED, the WELL Building Standard, Passivhaus, and the Living Building Challenge on a high-rise residential project. “We knew that health and wellness were highly valued by this client, and for us too,” Preston said. “We were very particular about the kind of food we brought in,” which included simple, colorful, whole foods. In general, she aims for supporting collegiality with something more like a family meal than a corporate boxed lunch. Before a meeting, Preston unwraps and breaks up chocolate bars; they’re a go-to item for keeping energy up, but no one wants to deal with that awkward crinkling sound mid-meeting. She pre-peels oranges and thinks through the setting of the table with paper, pens, and other items. “Everything is a design opportunity,” she notes. The meeting concluded on an encouraging note and has led to ongoing dialogue about the project goals, including wellness. “I believe that started with nourishment,” she says. When I picture a design charrette, I see architects huddled together, drafting, mapping programs, and detailing wall sections. I picture plans pinned on the walls. When it comes to the heart of a workshop, drafting can be an essential activity. But as we’ve been exploring throughout this article, the most successful workshops are a design exercise from their conception all the way through reporting out. They allow for deep input, conversations, and team building. Let the sketching and other specific work of design occur as an organic result of this broader setting. While that may seem like common-sense advice, how many meetings, workshops, or presentations have you been to where the facilitator is in front of the room fiddling with their equipment while people are gathering and eating? There are a lot of ways a facilitated workshop can go off-course, says Moshe Cohen. Trust among the group and with the facilitator is critical to bridging rough areas. He advises winning the trust of the group early in the process. Once Phaedra Svec has the right people in the room, she wants them to be transparent with each other. “You want them to show their work and have their assumptions shown in a common spreadsheet or up on the walls,” she says. If you’re not doing that, she warns, rather than iterating through progressively more appropriate solutions, you’ll end up in a circular conversation. Svec also notes, six months from now when you’re still tweaking your water usage numbers and how that affects the constructed wetland, you need to be able to see what everyone contributed and what they were assuming. With a current government client, Phaedra Svec was pushing them to consider drinking rainwater. Do you really know what’s in the city water? By asking a lot of questions, Svec says (“usually it’s about five layers deep”), they found that the client could see the possibilities of consuming onsite rainwater, but is concerned about becoming responsible for water quality and possible health repercussions. It’s not clear whether or how the project will surmount that objection, but at least they’ve identified the core problem. That could become a design challenge, or it could become a constraint, but in any case they aren’t wasting time talking about water filtration options. Rand Ekman of HKS likes to conduct deep research on a client’s regional and social context and mission before a major workshop. He then shares those stories with participants, who are asked to discuss overall project goals and pick targets on a scale, as shown here. Ekman likes to present sustainability-related topics in a way that relates clearly to the place of the project and the values of the people involved. For example, rather than talking about global warming in abstract terms, he relates it to the U.S. Heat Wave Index and its effect on asthma rates in the area. 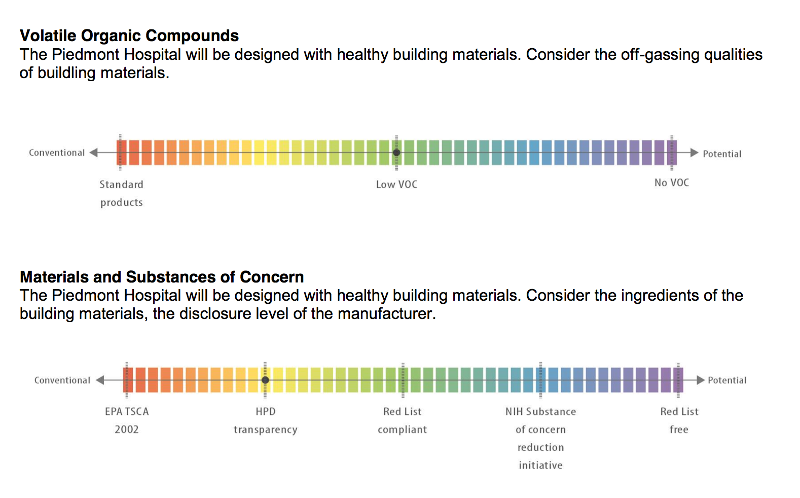 Ekman uses all that research as setup for activities where stakeholders identify exactly where they want to fall on a scale of options for topics like energy efficiency, ventilation effectiveness, and material health. Connecting to nature in whatever setting you’re in is useful on a number of levels, says Phaedra Svec. At one charrette, the group was working next to a green roof planted with prairie plants. After working through the morning, she asked people to go outside, close their eyes and take a deep breath and engage their senses. The instructions: take in the sounds and smells, feel the sun or the shade or the breeze, and then open your eyes and find something that’s living. While that exercise had a very specific impact on the project, the change in mindset is the real object, she says. “People get into that place of being a little bit more mindful,” Svec notes. “They set aside some of their anxiety about being with strangers. They tap into the creative part of their brain.” Being able to draw on that energy throughout the day is important. The following “Zooming In” exercise is one of a number of “iSites” used by Biomimicry 3.8 during workshops, and is used here with permission. It is adapted from Tom Brown’s Field Guide: Nature Observation and Tracking. Mark off a square foot (approximately 0.1 sq meter) of ground in any natural habitat, using string or sticks. Look at it from a standing position for a few minutes. Notice what you see, and describe the area. Make a sketch if you want. Then kneel down and observe it from that vantage point for a few minutes. Notice the things that you missed while standing. Next, lie on your belly or lean closer to explore the area in detail. Look at it as if you were an astronaut on a strange planet. If you find something that captures your attention, such as an insect, worm, or plant, observe it as long as you want, then explore somewhere else in your square. Stay with your exploration for at least 10 minutes. Finally, stand up and look at it from your original viewpoint. Don’t analyze it; just experience and appreciate the difference from how you originally viewed the miniature landscape. According to Richard Crespin, the “pre-mortem” meeting, for anticipating problems rather than waiting till they’ve happened, was developed after the Challenger disaster. After the Space Shuttle exploded during launch in 1986, the public learned that engineers had recognized a significant risk in proceeding with the launch; they had voiced those concerns but were ignored. “People behave differently in groups than they do as individuals,” says Crespin. “Part of being in the group is abiding by certain group norms,” which in the case of the shuttle engineers was a mentality called “go fever.” In the pre-mortem, Crespin says, “Let’s step back and look at all the ways this thing could fail. How can we mitigate or avoid these things?” An exercise like this makes it part of the meeting norm to ask challenging questions. For example, if a group is dissatisfied with some aspect of what they’re designing, Cohen might introduce them to Kurt Lewin’s force-field analysis, a framework that looks at how “helping forces” or “hindering forces” are driving movement toward or away from a goal. He’ll then ask the group how they could apply it this to the situation. Have you ever been in a brainstorming session that felt like it was moving too slowly or was bogged down by spending too much time on less effective solutions? At BuildingGreen, we sometimes combat these tendencies with the “note and vote” approach, which was popularized by Google Ventures. In “classic” note and vote, there is a decider who picks the idea or ideas that the team will go with. In a workshop environment, you could open it up to discussion. Should an unpopular idea be considered? If we accept the favorite idea, how do we build on it? Try note-and-vote the next time you need to generate new ideas or choose an option. “The design solutions are really amazing, and when you then get into the present day charrette, that thinking shows up,” he says. One workshop envisioned using algae as a natural pump for future water systems. Back in the present, that translated to concepts for integrating the building’s water systems as a visual feature. Another way to spur imaginative thinking is simply to set ambitious goals as thought experiments. For some projects, that might be Living Building Challenge certification. The trick might be finding the goal that’s exciting for the group but not too intimidating. If net-zero energy feels out of the question for an entire project, maybe there’s a wing that could be net-zero. And if that’s inspiring and gets traction, perhaps it can grow. 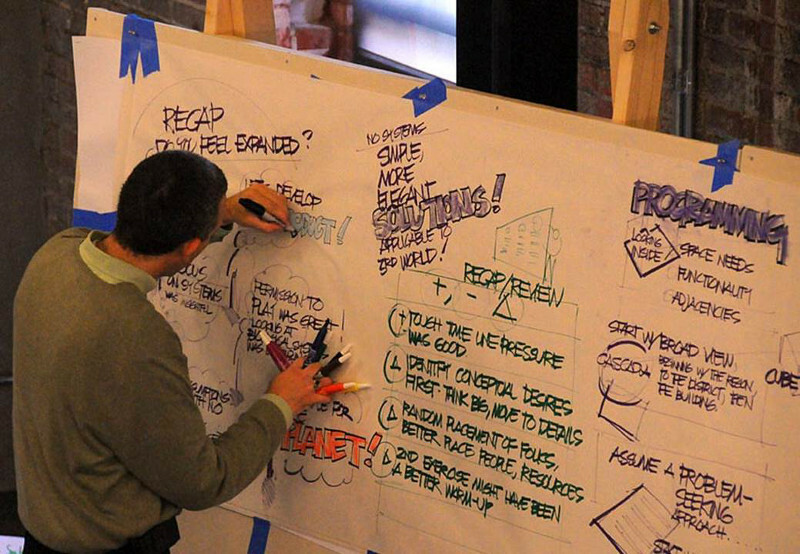 Jim Oswald graphically records dialogue during the Oregon Sustainability Center charrette. Capturing comments with flip charts, photos, and other methods not only helps a group hold onto ideas; it also helps individuals feel heard, encouraging participation. Whether or not your idea gets used, you want to know that it was heard. And when there is confidence that ideas are being heard, more ideas—and more radical ideas—tend to follow. Generating ideas and giving them air is one point of the workshop, but so is giving participants a sense of ownership and investment. For that, too, it’s essential that everyone feel heard. Lisa Petterson likes to employ really easy design tools in workshops, like wooden blocks and colored pieces of cardboard that represent difference pieces of the program. Taking notes on whiteboards or flipcharts is standard practice, of course, and some workshops hire graphic artists switching nimbly between five different colored markers to capture ideas as the group works. Whatever you do, “People just want to feel like their thoughts are captured,” says Petterson. If you’re taking photos of flipcharts or models, a Polaroid camera gives a physical sense that something has been recorded. If you’re going digital, Petterson says that having a computer in the room where photos are uploaded gives a real sense that the ideas haven’t disappeared. If you’re doing a multi-day workshop, how do you get the most out of that sleep cycle, as well as relaxed evening time? The question does a couple things, observes Svec. It displaces busy-work, like rerunning calculations after dinner, that would get in the way of reflection. It also gives people a sense that they’ll be returning to something fun in the morning. It also takes away anxiety about not knowing what you’re going to be expected to contribute the next day. Do you have time for all this? If you think you don’t, that’s a good sign you do. A new municipal office building to house the customer services and executive administration of Fort Collins Utilities was the focus of a multi-day workshop. Josie Plaut of the Institute for the Built Environment, which facilitated, credits the gathering and the alignment it supported with rapidly building consensus around a radical redevelopment plan for the block which led to the city council electing to shut down a street. Z Smith, while lamenting that some projects move on timeframes that make well planned and well attended workshops hard to do, says that they typically save time overall. The financial case is similar. Clark Brockman describes a typical workshop where the client “walks into the room and they see 15 or 16 people, most of whom are the most senior people in the firm. You can just imagine certain clients that start to tally; this meeting is clocking in at $6,000 per hour.” To get them to forget about that, Brockman says, “The goal is to meet or exceed the value that would have been achieved if those people were working for the client on different things. Shift their thinking and arrive at a solution they wouldn’t have gotten to” if they weren’t there. Doing that is a bit unpredictable in that you never know where the added value will come from, but it’s completely replicable with effective facilitation. Ralph DiNola talks about a project on which a developer was rehabilitating a historic property to lease to a university. The developer was respected for historic work but new to LEED and also new to the charrette process. Josie Plaut says that long and fancy reports have helped make some projects feel that they can’t afford workshops. “It’s the process itself which is the value-add and not the report,” she contends, noting that the Institute for the Built Environment now spends much less time (and fee) on creating a report. A good workshop will produce a high-functioning team with a unified understanding of its vision and likely strategies. “You know the project will be better,” says Clark Brockman. Ralph DiNola agrees that integrated workshops are really about building effective teams. He asks, “How are you going to change what their process is to deliver on that not just once but many times?” Once an organization has some experience with workshops, DiNola suggests finding new areas to apply them. At one corporation, he says, the group was so pleased with charrettes done for individual building projects that they did a charrette just focused on commissioning. Commissioning agents were running into roadblocks and finding that teams weren’t coordinated around their work. The workshop focused on solving those problems as a team. DiNola has done lots of workshops for design and construction projects; he sees value in doing more at the organizational level. If this article were a workshop, I’d want to check in now about your experience. Did you get a couple ideas to apply to your next event? Are you inspired to bring a more integrative process to your next major project meeting? Again, please leave a comment, or contact me with your thoughts. Receive continuing education credit for reading this article. The American Institute of Architects (AIA) has approved this course for 1.5 HSW Learning Units. The Green Building Certification Institute (GBCI) has approved this course for 1.5 CE hour towards the LEED Credential Maintenance Program. The International Living Future Institute (ILFI) has approved this course for 1.5 LFA hours towards the Equity petal. Explain how the right mindset contributes to a successful design workshop. Schedule a design workshop, set its agenda, and balance the skills of its participants. Build trust, teach models, manage difficulties, and document ideas in a design workshop. Stretch the group’s vision to maximum benefit and extend the value of the workshop to produce a high-functioning, unified team. I have become more mindful of what I feed people as well as how and when. Taking a social break to eat together often helps making it easier to bond or digest or process informally. Also sugar and carbs are the enemy of creativity and focused attention. And when sitting all day (a crime in iteself) it is detrimental to our health and wellbeing to eat a bunch of junk. I know everyone wants donuts and coffee, but I care about people too much to provide that when I am hosting. I couldn't agree more with Z-Smith that to not take the time to have these worksessions early in design is more of a risk in the long run. As important as having a signed contract, having worksessions that get everyone focused on what they are trying to bring about is just as essential. Without it, you can't help but waste time and you might veer so far off course that you have to start over. Say more about Technology of Participation? That sounds really intriguing, Michelle. Can you say anything about the key tenets of this method? What makes it great? There are many different types of ToP workshops including action planning, strategic planning, environmental scans (context on where we've been and where we're going), and implementation planning. At the core is the focused conversation and the consensus workshop. A focused conversation guides a group to a shared understanding starting with simple objective questions, then reflections that address reactions, then interpretive questions to get a deep understanding, and finally decisional questions (i.e. so what?, wh at's next?). There is a wonderful book, The Art of the Focused Converstation, edited by R. Brian Stanfield, which explains in greater detail and includes 100 sample conversations. 5. Resolve: Reflecting and next steps, which depend on the overall plan for the entire workshop. The beauty of the process is that every voice is heard, and large groups reach consensus quickly, there is a clear process for implementation plans, and it is very easy to record and distribute the results of the workshop in short order because you use a huge sticky wall where everyone can see everything at once. While this process was not developed specifically for design workshops, I have adapted it to do so and am happy with the results.